Update: Wizards is now making pdfs available at D&D Classics. You can purchase pdf versions of the original B2, as well as a bundle of the Basic series of adventures! 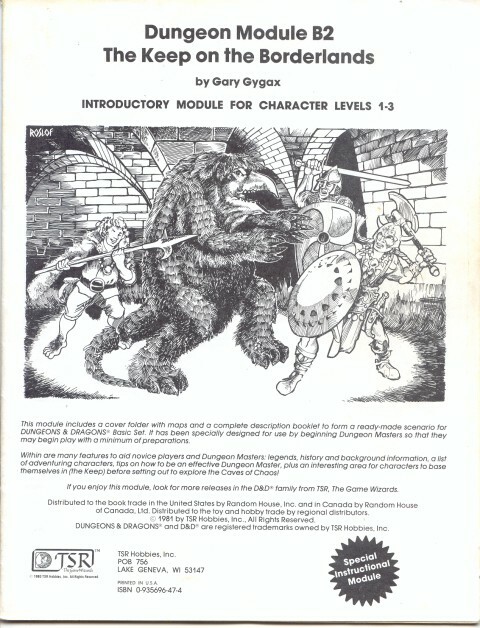 Last time we mentioned that it is easy to convert classic adventures to D&D Next. We also talked at a high level about some of the shortcomings of old adventures and then went through the history of The Keep on the Borderlands. Thanks for the great feedback on that and earlier blogs! 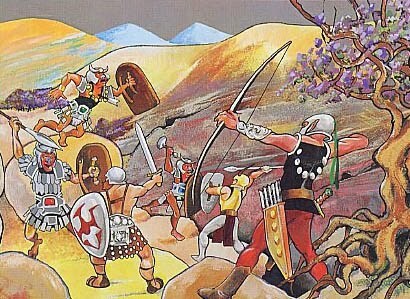 This time I want to look at how we can use the D&D Next playtest packet to improve on classic adventures. The easiest way to do that is to look at Caves of Chaos. In later installments we can apply these lessons to other adventures. First and foremost, what we are doing is a playtest. We want our feedback to be valid and to be useful to the Wizards team, so we end up with a great game at the end of the process. This means we don’t want to make changes so radical that we can’t playtest… unless our aim is to tell Wizards how easy/hard it was to customize (and even then, this has far lesser value than playtesting the actual rules). Classic adventures can sometimes have only a very few thin actual events. You learn of the dungeon, enter the dungeon, kill various things for no reason beyond ‘evil’ and ‘loot’, then discover some really bad evil and hopefully leave with treasure and having ended the evil. How those events relate together and how they relate to the players can be even thinner. 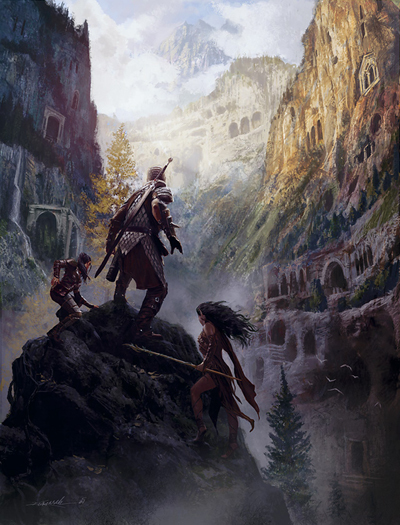 With modern adventures we see improvements, such as a compelling hook that ties to the PCs, several events that precipitate or delay other events, grand themes such as morality/cosmology/history/power/culture, and choices that vary based on the player and PC. When possible we want to bring that richness to the adventure. Related to the above, great adventures revolve around the PCs. The story and narrative is shaped by the themes that matter to them. Room after featureless room of the same creature can get pretty old. “I hit it with my axe” grows tiresome when it is the only action available. Going from orcs to hobgoblins is barely registered when the motivations and environs are the same. 4E made great advances here, allowing a fight with kobolds above us on platforms while we tried to rescue the dwarf from the pit containing the ooze while the huge stone ball rolled closer to us down the hallway (and toward that poor dwarf). Not every fight needs that, of course! Also, we want enemies to respond to heroes as appropriate. They should be real foes. They barter, anger, cower, adapt, defend, prepare, bluster, feint, etc. Old adventures often lack a sense of mechanical balance. A single kobold in one room, an impossible fight against a beholder in the next. The game (and the narrative) play better when the challenges make sense and aren’t wildly disproportionate. At the same time, we do want diversity. Old adventures vary in the quality of their descriptions. Some feature endless levels of near-featureless rooms. We want to keep things varied and even make things up on the fly based on the PCs. The playtest packet contains some really useful tools for altering classic adventures. We will walk through the above issues and take a look at what the playtest packet provides. I will also share what I did in my own sessions. A key to playtesting is to provide a varied but true experience. To this end, the playtest adventure contains many different areas and many different creatures. In fact, between the adventure itself and the Bestiary, we have both the raw monsters and examples of encounters we can emulate. In my games: When running Caves of Chaos I asked tables where they had been, then changed the story to lead them to new areas. For example, if they had fought kobolds and orcs, I altered my default story to be about goblins and hobgoblins. If the party was very seasoned and looking for a challenge, I changed to involve the cultists and some of the tougher monsters. I also made use of a very critical tool used widely in 4E: reskinning. Reskinning means taking the mechanics of something but flavoring it otherwise. For example, the Bestiary lacks a spider but has giant centipedes. We can call them spiders and they work just fine. If you want to enhance their spidery nature, make them medium size, remove the swarm ability, and let them crawl on walls and ceilings (and perhaps once/combat they could do a cool jump). Such changes are still honoring the basic balance of the creature so we still have a suitable playtest, but they keep the playtest interesting over time. Further Ideas: We can also expand beyond the initial caves. The cultist’s chambers could have an underground tunnel leading to more caves, where we have more foes (reskinned when suitable). Or, perhaps clearing out the caves leads to a new foe entering the valley. This can extend the playtest experience. The original adventure was largely a dungeon delve, though it had so much potential. We can see bits of it in things like the goblins having a relationship with the ogre. Time spent on coming up with an interesting premise that evolves will create a more gripping experience. Ideally, the narrative plays out based on character choices. D&D Next is great for this because it is so adaptable. The playtest packet begins with excellent advice around asking questions of the adventure and weaving a plot based on the answers. The packet has some great ideas such as this being a staging ground for war, a lost heir, digging for Grumsh’s eye, and more. We can play with those ideas further. Looming War: This concept can be especially fun if the war plans have been sent out to each clan and are in motion. PCs have to figure out each set of plans and modify or stop them without tipping off the entire caves to their presence. Plans can get personal if they threaten an aspect of the PCs’ backstory (for example, one set of creatures plans on taking down a knightly organization to which the cleric with the knight background aspires joining). Or, perhaps the cult has some special means of establishing order. The PCs could find this and destroy or alter it. For example, what if they cult has made promises it can’t actually keep, and which the PCs can unravel or even trade with different species? Find the Heir: A variant that can be fun is having the heir be young and impressionable and become enamored (even on an innocent mentor/hero level) with a PC. Another is the heir that is a ‘royal’ pain, upsetting the party’s plans and demanding that certain things happen (such as recovering the heir’s belongings which have been spread across the Caves). For even more fun, the heir or other prisoners could be revealed to be related to one of the PCs or perhaps has a background or theme in common. In my Caves of Chaos: When I ran this at D&DXP I benefited from some neat ideas from Shawn Merwin and Philippe Menard (both write for Critical Hits, amongst other accolades). I took their ideas and ran with them. 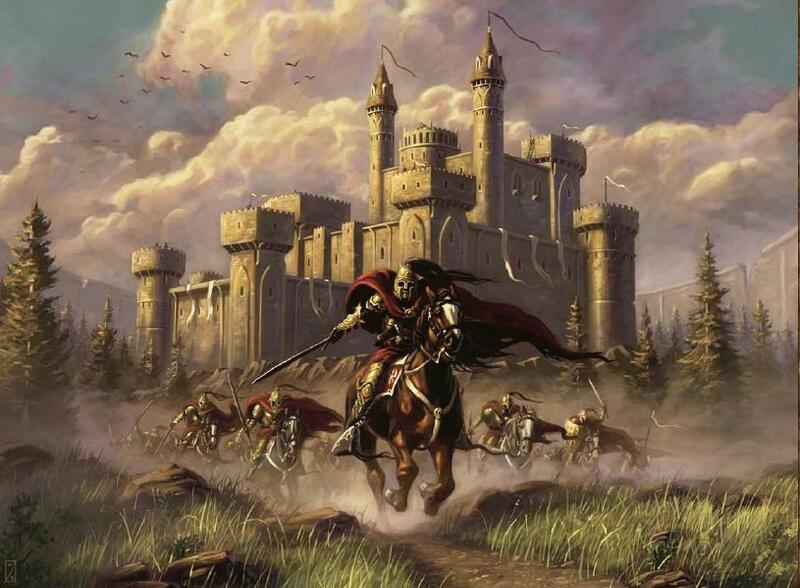 I started with the PCs having just arrived in the Keep, when a rider enters the keep calling for help. Out of breath and scared out of his wits, the rider says goblins ambushed him! PCs probably ask how the rider survived, and that’s when he admits that the goblins didn’t actually attack… in fact, they handed him a strange crude note and let him go! Looking at the note, it is in really (humorously) bad common, begging for heroes to come at once and save them. This played extremely well. It was humorous enough to loosen up new or tentative players, but also had an element of danger. Was it a ploy? At the bottom of the note (actually carved on rough bark) was a crude semicircular design (eventually figured out as a map of the caves, with a mark where the goblin lair is found). When the party approached it was first a humorous negotiation. The goblins indeed want help, because the male hobgoblin chief is trying to marry the female hobgoblin chieftain and has decided to exterminate the goblins and gift their lair to her as a sort of dowry. (The orcs also work well for this). This created some good choices: should the party agree to this, wipe out the goblins, or use this information to somehow create even more chaos? To add to this, the goblins of course aren’t innocent. They will reluctantly admit they recently sent scouts to raid an elven caravan destined for the Keep’s jeweler, because the groom demanded a ring to wed. The caravan was likely already raided… they wonder why the goblins haven’t returned yet. Hmm. This premise worked on several levels. First, humor is a good way to keep people positive for a playtest. We want this to be fun. Second, it provided a (strangely) interesting and compelling hook for the PCs to set off on adventure. Third, the plot has a lot of flexibility. We can have the wedding go off or not, have different races involved or not, and alter things on the fly for fun. Female hobgoblin chief in her wedding gown battling the PCs, with a goblin tailor trying to mend the holes the PCs are making with each hit. Groom hobgoblin suddenly realizing this isn’t all about power and actually loves the bride… and then the PCs gleefully deal the killing blow. Fighting orcs in the reception hall, and PCs wrecking the arrangements to cause most of the orcs to try to fix things instead of fighting back. PCs deciding to find the elven caravan in turn are ambushed by the ogre, who doesn’t want to give up the wedding ring. At another table, the ring ended up in the owlbear cave with PCs trying to sneak in to get it (and ending up in a fun fight). Further ideas: Story-wise, look for a central concept (what is taking place in the Caves of Chaos that would be interesting?) and add dimensions to it (how does that relate to the PCs and/or to the different caves?) and triggers (what things impact/change the story?). Sketching out some ideas and then changing them on the fly works really well. Fast and loose is often better than being over-prepared, because you feed off of the players. Use what the players give you and make their assumptions true rather than sticking to your script. One of the benefits of Next, where you aren’t using massively planned set-piece encounters, is you can move things around (such as the ogre, where the ring is, etc.). Watch the PCs’ reactions. Do more of what they are enjoying and develop the narrative in that direction. Any adventure can be made better if we give the players ideas on why they are here, who they are, and create some relationships between each party member and from each party member to the setting. In my Caves of Chaos: I kept this one simple. I started with character introductions, asking each PC to state their name, class, race, theme, and background. In some runs I asked them to spend a few seconds thinking about how their theme and background had led them here. During play I had a list of this information and I tied the events to their PCs. For example, if someone was a diplomat, I had NPCs look to them to negotiate, giving that backstory a chance to shine. It worked well enough. One player said she knew she couldn’t keep her PC (due to the NDA) but that her next PC she would make would be like this one “because I already have her personality all worked out.” After four hours? Win! Further ideas: I’ve written before about character backstory. I’ll share how I used those concepts in greater detail in later blog posts when I look at the Temple of Elemental Evil and the Slaver series. D&D 4E is capable of delivering some amazing cinematic experiences. Adventures I’ve had the pleasure of writing have included fights on moving chariots, Indiana Jones-styled temple rooms filling up with tons of snakes while a stone door closes on their goal, a game of artifact keep-away on top of bobbing ice blocks and ice chutes, and more. 4E made these exciting scenes possible with well-balanced terrain, cool traps, and 3-D grid elements. We can still take some of these lessons and harness the best from them in D&D Next. In the Caves of Chaos: The skill system is excellent for improvising. Because D&D Next isn’t such a carefully balanced system, we can have a player what their PC wants to do (“Can I use my fire spell to set all of the wedding invitations on fire?”) with either a skill check or attack roll (“Yes, if you make an Intelligence check using your knowledge of magic you can do so” or “Yes, make an attack roll to see how well you target the papers with your spell”). In general, improvise for fun. It is fun to see the orcs’ wedding invitations set on fire and have half the orcs focus on putting out the blaze instead of killing the party, so set the bar roll and have failure be only a partial failure. – In a far corner is a lit lamp full of oil (which can be thrown, accidentally broken, etc.). If PCs don’t use it, a foe does. Maybe the PCs even get a round to stop the foe that picks it up (“shoot the oil lamp, rogue!”). The original Caves lacks balance, and the original isn’t that far behind. Up to 30 orcs? As the playtest packet mentions, work with group numbers to keep things manageable. When possible start with small numbers, letting the party get some victories before facing larger groups. Based on their hit points and spells remaining you can move foes into or out of encounters. Those 30 orcs? They might all be there if the party was nigh invulnerable when they faced the hobgoblins. On the other hand, if the party is barely alive after facing 4 orcs, then many 25 of the orcs are out somewhere (and will return). D&D 4E provides PCs with a greater cushion against damage. D&D Next has less of a cushion (though more than 2E and earlier). Because of that, consider bringing foes into the fight in stages. The room with 30 orcs might have just 5 initially, but they call for help. PCs hear footsteps coming from whichever direction they didn’t come from, and next round the first wave shows up. This makes the fight dynamic and, more importantly, manageable. In the Caves of Chaos: I like to use the environmental factors (such as noises and smells) to give PCs the ability to sense how many foes are beyond. I keep my eye on surrounding rooms and adjust or move creatures in them based on what would enhance the fun. If something seems too hard, I get rid of it or reduce the number appearing. If my changes are worth reporting for the playtest (such as always needing to reduce or increase the number of foes) I make sure to capture that and share it. Caves does a pretty good job of making the different rooms interesting. We can look at those attempts to make rooms different and apply it to other classic adventures. In the Caves of Chaos: We can add to this by giving different monsters personalities, distinguishing marks, and motivations. Maybe one orc is glad to be a turncoat, and the others start attacking him. Maybe one kobold is smelly and offers to parley and travel around with the PCs, much to their nasal demise. Maybe an orc eating a meat pie chokes on it when the PCs enter and through the combat is trying to take in air while fighting. Further Ideas: Consider how individual objects can create a rich experience. A partial map of another cave, or the hilt to a fine weapon can be a mini-adventure. One idea can quickly lead to another. For example, an idea to place a crude drawing of a beloved can be a bit of color. If we make the drawing out to be of a different species in another cave, and both Romeo and Juliet are still alive (but perhaps recognizable… maybe the party finds a note saying he will wear a red flower and asks her to wear a white one…) we can really have some fun. Next time we will look at a different classic adventure, Slave Pits of the Undercity, and share how we created an exciting 4E-styled combat! Bundle of B-series adventures, B1-B12! Of the B-series, my personal pick for conversion to D&D Next would be B-7 Rahasia. It may merit its own conversion column in the future. It has some of the design aspects (such as creative traps) that make the Desert of Desolation series so memorable. It also brings a pretty nice story together (so you aren’t just dungeon delving) while providing some creative play moments. 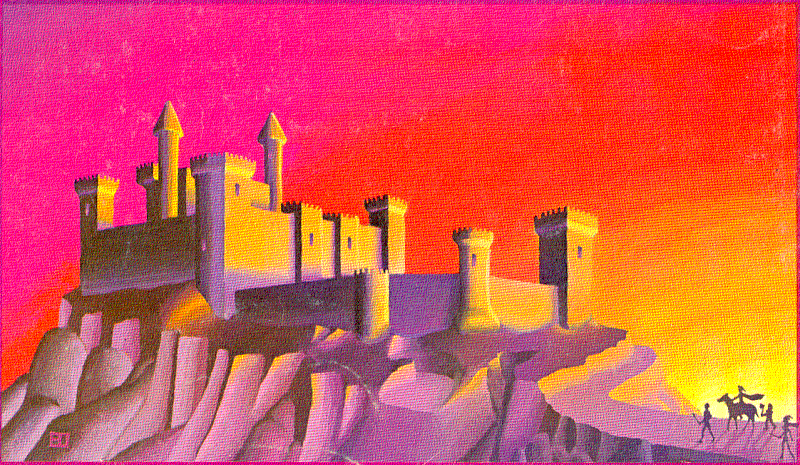 The mention of Desert of Desolation isn’t a coincidence – all were written by Tracy and Laura Hickman (and Rahasia began as their own endeavor before becoming an RPGA adventure and finally the version known as B7). Inside cover of B2 – just an owlbear… no Flumphs! This entry was posted on October 17, 2015 by Alphastream and tagged 5E, Backstory, Basic, Challenge Level, Conversions, Playtesting, RPG History, World-building.